We spent 19th March, the anniversary of Pujya Niruma's mahanirvana day, in celebration of her extraordinary life and still-living presence. That afternoon, a special DVD showcased Pujya Niruma's remarkable life with a focus on the unconditional love that she embodied. No eyes remained dry in the satsang hall! In the evening, our extended community gathered to witness a special ceremony for the brahmacharya group (a select group focused upon celibacy and self-less service). New members were announced, while others were celebrated for an elevation of their spiritual stage and status. Everyone present (children, adults, and seniors; married and unmarried; mahatmas of every religious orientation) were inspired and renewed in their spiritual journey. 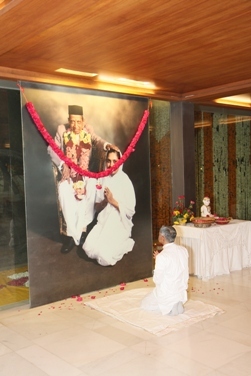 Pujya Niruma's spirit continues to be felt by us all. Her touch upon our lives remains ever-fresh, and we remain inspired to live the divine qualities that she embodied.